It's been four months since Jace and I went to Gallipoli, which was the last time we were out of Istanbul (unless you count our day trip to Kilyos, which I don't). Naturally, when we knew that we would get a few days off work at the end of Ramazan, we jumped at the chance to plan a trip out of the city. As fans of all things ancient, we decided to go to Ephesus - called Efes in Turkish - just near the present-day town of Selçuk in the Izmir province on the Aegean Sea. Second only to Pompeii in Italy, Ephesus is the largest and best-preserved ancient city around the Mediterranean and, second only to Sultanahmet in Istanbul, is the most visited tourist attraction in Turkey. Most tourists go to Ephesus just for a few hours as part of a coach tour of Turkey or a day-on-land tour from one of the many cruise ships plying the Mediterranean. It was nice to stay in Selçuk for several days and see what the area had to offer besides ancient ruins. 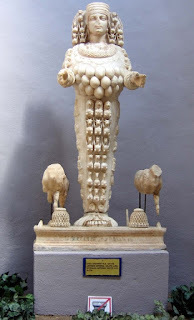 Of course, we had to start our visit with Ephesus, and more specifically the Ephesus museum. 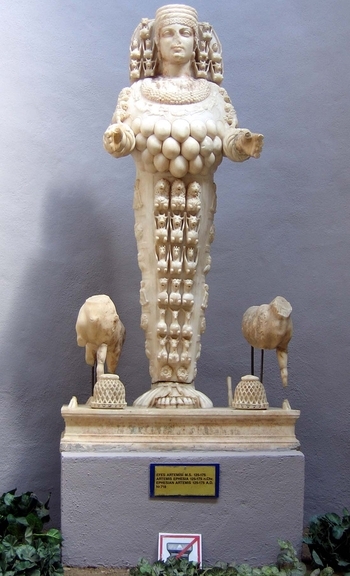 Although small, the museum contains the most interesting and well-preserved pieces from Ephesus and the Artemision (the sanctuary of Artemis), including statues, friezes, sarcophagi and stelae as well as ancient coins and ceramics. Next on the list was Ephesus itself. As it's only 3km from Selçuk, we decided to walk there past orchards of peaches and quince. The site itself is HUGE, which comes as no surprise from a city which was the capital of Asia during the Roman imperial period and had a population of over 250,000. Looking across the site from the Odeon; the crane in the middle distance is next to the Theatre - Ephesus is huge! The picturesque village of Şirince is a must-visit for all travellers to the area. Only 8km from Selçuk, this charming place is famous for its fruit wine (which we sampled but did not enjoy), olive oil, fresh produce (including enormous peaches), dried herbs and handicrafts. We stopped to watch a glass-blower at work outside the Basilica of St John and I snapped many photos. My now-obvious baby belly inspired him to make a little glass dummy which he gave us as a gift. For our last day in Selçuk, we decided that we had to swim in the Aegean Sea since we were only 7km away. After a lovely lunch of local fish and salad dressed with olive oil and pomegranate sauce, we walked along Pamucak Beach and sneakily used a couple of lounges in front of one of the resorts for a couple of hours. The water was shallow, warm and very pleasant, despite the large amount of seaweed. I was sad to leave Selçuk with its warm, dry climate, tasty fresh produce and relaxed country atmosphere, but unfortunately the bayram had to end as all holidays do. Thanks to Derviş and everyone at Homeros Pension for the hospitality and delicious food.